Some of the presentations from the 2015 conference are now available from the final schedule page. The new and continuing CPHC Officers and Committee have been elected following the Annual General Meeting at Queen Mary University London. CPHC Chair, Sally Smith, continues for the second year of her two-year term, as does Carsten Maple (University of Warwick) as Vice Chair. Colin Johnson (Kent) takes over as Secretary from David Duce (Oxford Brookes), who retires from the committee with thanks from everyone for his service. Edmund Robinson (Queen Mary, London) continues as Treasurer and Iain Phillips as Past Chair. Current committee members, Balbir Barn (Middlesex), Miltos Petredis (Brighton), Stephen Jarvis,(Warwick) Sally Fincher (Kent), Rupert Ward (Huddersfield) and Vic Grout (Glyndwr), are joined by new committee member, Keith Miller (Manchester Metropolitan). Ian Wells (Swansea Metropolitan Trinity St. David) also retires with thanks. 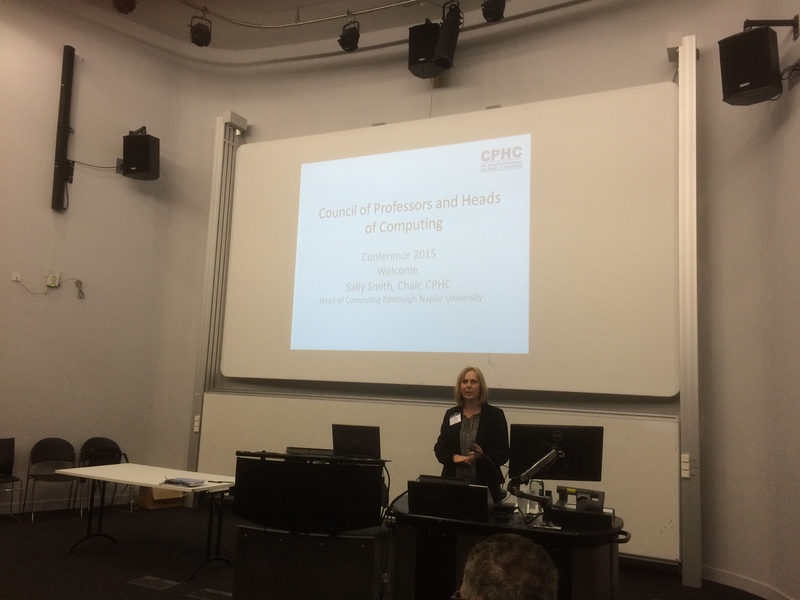 The 2015 Council of Professors and Heads of Computing Annual Conference has started at Queen Mary University London. CPHC Chair, Sally Smith, opened the conference, followed by a keynote from Bertrand Meyer from ETH Zurich. A full conference programme lies ahead over the next two days, including the AGM. The annual conference and AGM of the Council of Professors and Heads of Computing starts on Monday 27th April 2015 at Queen Mary University London. A full conference programme is now finalised and further details, including location and AGM papers are now available. The conference will be opened by CPHC Chair, Sally Smith, followed by a keynote from Bertrand Meyer from ETH Zurich. CPHC Patron, Technology campaigner and TV personality, Maggie Philbin, will deliver a welcome and keynote on day two (Tuesday) of the conference.